When Maori first arrived in Aotearoa (New Zealand) some 800 years ago, the land they encountered was dominated by birdlife. The land, sea, rivers and mountains would have overflowed with the richest and most extravagant bird fauna imaginable, including some of the most spectacular birds of prey ever to have existed. Landing into this “Bird-land” it is easy to imagine that birds would have infiltrated every moment of those new arrivals. Within Maori culture, people and birds were traditionally associated by poetic metaphor, by appearance and behaviour. For example, the choice of bird feather worn by a warrior was a symbol of association between the human and the chosen bird. Warriors who wore the head plume of the Karearea were asserting that they were as fierce and reckless as the falcon. As those that have entered a falcon nest can attest – this would have been a warrior to avoid!! Did you know the All Blacks mimic a raptor every time they play? 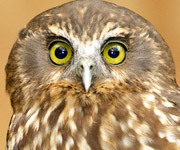 It is said that the glaring, fiery eyes of the Morepork inspired the rolling ‘pukana’ eyes seen in many haka and waiata. Most famously, the pukana is employed during the ceremonial ‘Ka Mate’ haka by the All Blacks before a rugby game. There is no doubt that these glaring eyeballs play a significant part in the intensity of this powerful haka. So the next time you see the All Blacks steam over the try line say a small thank you to our friend the Morepork for its handy tip on how to intimidate the opposition! The glowing eyes of the Morepork are similarly found in many Maori carvings, with paua shell being inlaid into the wood to make them a prominent, staring feature of the carving.